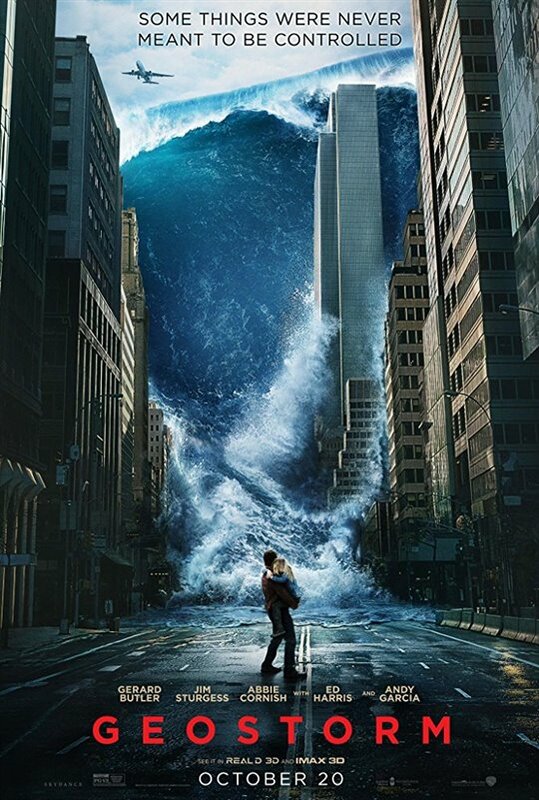 Geostorm - Jake Lawson (Gerard Butler) and his brother Max (Jim Sturgess) must stop their weather-controlling satellite program, dubbed Dutch Boy, after it begins malfunctioning, causing dangerous and destructive weather patterns on Earth. Opens wide today. Click here for showtimes. Only the Brave - An elite team of firefighters known as the Hotshots races to Granite Mountain in Prescott, Arizona, to stop a destructive wildfire before it threatens the local community and its inhabitants. Based a GQ article titled No Exit recounting the true story of the Granite Mountain Hotshots. Opens wide today. Click here for showtimes. The Snowman - Lead crime investigator Harry Hole (Michael Fassbender) is looking into a bizarre case where a missing victim was found dead, frozen in a snowman. But the case leads him to the conclusion that there is a deranged serial killer at work and in order to stop more killings from happening, he must connect other strange murders from the past. Opens wide today. Click here for showtimes. Same Kind of Different As Me - Wealthy Texas art dealer Ron Hall's (Greg Kinnear) life takes an interesting turn after he crosses paths with a homeless man named Denver (Djimon Hounsou). Based on the memoir Same Kind of Different As Me: A Modern-Day Slave, an International Art Dealer, and the Unlikely Woman Who Bound Them by Ron Hall and Denver Moore. Opens wide today. Click here for showtimes. Tyler Perry's Boo 2! A Madea Halloween - Madea (Tyler Perry) is back in this Halloween sequel where she vows to stop a group of kids who decide it's a good idea to party near Lake Derrick, famous for being the site of 14 murders. But when Madea and her family arrive, they find the lake is actually haunted. Opening in select theaters today. Click here for showtimes. Breathe - This romantic drama tells the love story of Robin Cavendish (Andrew Garfield) and his wife Diana (Claire Foy), who are tested when Robin is hospital ridden due to polio. Diana refuses to leave her husband to die in hospital and vows to do whatever she can to bring him home where she can care for him herself. Opens in Toronto today; Vancouver, Edmonton, and Calgary on Oct. 27; and wide on Nov. 3. Click here for showtimes. Leatherface - The origin story of the psychotic and gruesome Leatherface killer is told, beginning with his youth and subsequent placement in a mental institution where he eventually breaks out and begins his horrific killing spree. Opening in select theaters today. Click here for showtimes. Una - Ray (Ben Mendelsohn) was imprisoned after having an intimate relationship with a girl named Una (Rooney Mara) when she was just a teenager. His new life is interrupted, though, when Una tracks him down years later, forcing the two to face some unrequited feelings. Opening in select theaters today. Click here for showtimes.